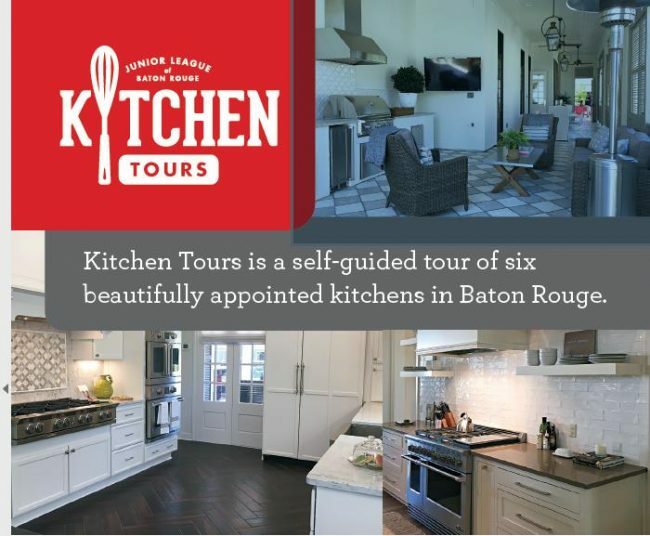 What: The Junior League of Baton Rouge’s Kitchen Tours event is a self-guided tour of six beautifully appointed kitchens in Baton Rouge. When: Sunday, April 2, 2017, 1 – 4 p.m. Cost: $20 General Admission. Tickets include admission to all six homes on the tour! A limited number of $100 VIP Tickets are also available that include brunch and a limo bus to bring you to each home, and other goodies from our sponsors. The Deets: We are especially excited to announce that this year’s Kitchen Tours will showcase the gorgeous kitchen of one of our Sustainer Members, Helen Bolin. You can read about Helen’s Garden District kitchen-remodel here! Incidentally, Helen’s mother, Mrs. Prentice Bolin, was also a Junior League member, and she contributed several recipes to our much loved River Road Recipes I cookbook, from a refreshing Pineapple Fizz (p. 8) to delicious Fluffy Dumplings (p. 42)! The Junior League has also joined forces with Acadian House Kitchen + Bath Design and Stone Baton Rouge for this fabulous event that you will not want to miss!